I found the following oil filter cross reference site http://www.calsci.com/motorcycleinfo/FilterXRef.html. Footnote 7 at the bottom of the page suggests that I should use the longest filter of three lengths that will fit in the space provided. To get a better understanding here is a cut and paste from the site. [size=1.125em]These Oil Filters [/size]have 3/4"-16 threads, by-pass valve, no anti-drain back valve. BMW motorcycles with spin on filters use three different filters. The only difference I can see is the height of the filter - it's either 65mm, 71mm or 90m. If you have room on your bike for the 90mm filters (listed below),use those. The 65mm filters are made to a very old spec with inferior filtering and should be avoided. Use one of the 71mm or 90mm filters instead. What are the members of this forums opinions on this? It sounds very reasonable to me. The Calsci site lists 3 sizes of oil filter for a 2012 RT, together with manufacturers e.g. Hiflo. I use Hiflo oil filters, the correct one for my bike is a HF164. I wouldn't fit an oil filter to my bike which doesn't meet the BMW OEM spec., Hiflo filters do. Would I want to reduce the ground clearance of the sump/oil filter by 90 - 54 = 36mm, no. My bike is a 2018 R1200RT on which the filter is vertical to the left side. So installing a longer filter would not decrease the ground clearance. The author of the article sees no difference in the three filters except for the length. They all have the same threads, a bypass valve, and no anti-drainback valve. One thing that I am concerned with is the pressure at which the bypass valve would work. I would want them to be the same. If that is true it would seem to me that the longer filter would have more capacity. Surely BMW have done their R&D and selected an appropriate oil filter for each model of RT. To maintain the T&C's of the BMW Warranty, "you must, use genuine parts, or parts of equivalent specification". BTW, does anyone know what company makes the oil filters for the current RT's? Does anyone know what company makes the oil filters for the current RT's? 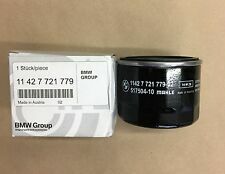 This photo shows that the oil filters are made in Austria by Mahle.